Panda Express Introduces New Golden Szechuan Fish - San Diego Dining Dish! Panda Express, America’s favorite Chinese restaurant, is setting a new gold standard for fish in the fast casual restaurant category with its newest entrée, Golden Szechuan Fish. 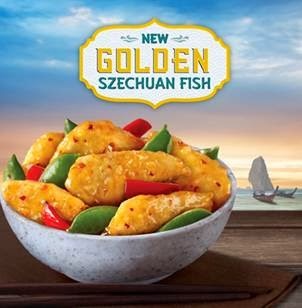 Made with 100 percent wild-caught North Pacific Cod and inspired by the culinary flavors of central China, Golden Szechuan Fish combines hand-sliced, lightly battered cod fillets, crisp sugar peas and sweet red bell peppers wok-tossed in a zesty Szechuan sauce. Just in time for the Lenten season, Golden Szechuan Fish will be available at participating Panda Express locations for a limited time beginning Wednesday, Feb. 26. North Pacific Cod is a lean whitefish with a sweet flavor, delicate texture and melt-in-your-mouth flake. It also is an excellent source of high-quality protein. Panda also offers other seafood options throughout the year such as its award-winning Honey Walnut Shrimp, made with fresh tempura shrimp wok-tossed in a gourmet honey sauce and topped with glazed walnuts.